10/01/2014 -- Machine Incorporated, a modern, high-tech and quality-minded machine shop specializing in CNC machining of precision components and assemblies for the aeronautical, medical and analytical instrument industries, introduces a Nakamura Tome NT MX5 axis turn-mill machining center to support its lean manufacturing operations. This multi-functional turning center features a fusion between a lathe and full five-axis milling platform with a distinctive B-axis configuration, and dual, 24-tool ATC magazines ideal for manufacturing low volume, and high mix of complex parts with critical contours in one easy set-up. Built upon the “done-in-one” concept, NT MX5 incorporates all machining processes – from raw material input through final machining – in just one machine. As a result, the concept provides the ability to reduce cycle times, increase changeover speed, improve profile milling accuracy, and meet tight tolerances. 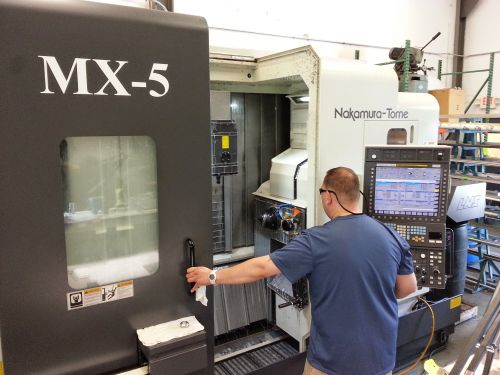 Richard Mileika, President of Machine Inc, said, “The Nakamura Tome NT MX-5 perfectly complements our business model, based on lean manufacturing principles to ensure high-precision, superior-accuracy and quality machining. The 5-axis technology is equipped with solid machining capabilities which give us the flexibility to simplify our operations and maximize productivity, while taking on jobs with a wide variety of part sizes, materials and geometries.” NTMX unique design comes with twin spindles, a single lower turret, a rotating milling head and two front ATC magazines for easier tool management and greater process flexibility, which further lends the machine its competitive advantage. Machine Inc utilizes this state-of-the-art equipment coupled with over 35 years of industry experience and concurrent engineering to serve growing number of industries and accommodate their on-time/on-budget/on-demand requirements. Machine Incorporated has established itself as a “Low Maintenance Key Supplier” CNC machining source that is dependable in both product and customer service. With a common sense approach to business, Machine Inc. has maintained a high standard of quality, consistency and cost effectiveness. Machine Inc. state-of-the-art equipment and adherence to strict manufacturing, verification and Lot control documentation standards ensure parts are flawless, are produced on time and meet precise specifications and needs. By employing Lean practices and Kanban systems, it is also one of the few firms in the space to use cloud based inventory management for optimizing and automating inventory control processes of its clients.